I finished the 2012 Whistlestop Half Marathon in 2:21:32, but it wasn't pretty. Nancy ran with me for this race (considerably prettier), which was fun. Except when I started losing it around mile 9. I started too fast, rookie mistake. The trail was soft, and so were my feet, so blisters. Cold, wet, a bloo bloo bloo. I'll write more later, probably when photos are up, but it's now time for some BICE*. Or in, rather. 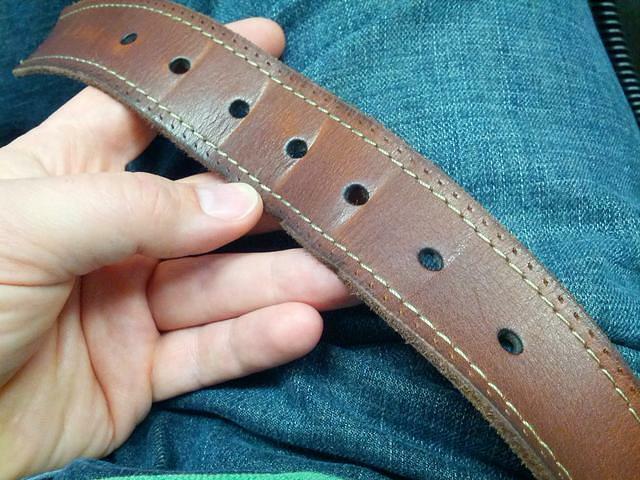 One hole left before the leather punch comes out. Let me tell you, trying to figure out why your pants are falling down all the time can be a confounding experience. Just ask James.